I've lived most of my life by shoulds. Growing up, I was the all-American good girl. I did well in school. I went on mission trips. I moved to Africa when I was 19 to serve as a missionary. I did everything "right". By the book. The way I was supposed to, expected to, told to. The way I should. But the treadmill of striving is exhausting. If only I could do more... If only I could do better... Yet for every should I managed to check off, more got added to the list. It was a vicious cycle of defeat. In my painful journey of the past few years, I realized how badly I needed to stop should-ing on myself. And I discovered how challenging it can be to get off that treadmill. One of the ways I've found some freedom from the should shackles has been by ditching New Year's Resolutions. I used to make a long list of goals I'd like to achieve in the new year, but never managed to live up to them (or, at times, even remember what they were). It only left me feeling like a failure. So I began choosing just One Word as I step into a new year. One word that sums up who I want to be, or a character trait I want to develop, or an attribute I want to intentionally add to my life. And since it's just one word, it's easy to remember. I place reminders of it around my home and workspace, and I inevitably start seeing and hearing it everywhere, which helps me stay mindful of it. One year, I committed to risk more—it forced me to step out of my comfort zone and do things I wouldn't ordinarily do. Another year, my word was look—it gave me eyes to see God's divine fingerprints even in the darkest of moments. This past year, my word was choose—a daily reminder that while I can't control what happens to me, I can always choose my response. My One Word isn't another to-do list. It's simply a guide as I make decisions, set plans, and go about my every day. And I've seen these words shape not only my year, but also myself. They've challenged me, inspired me, changed me. Such is the power of intentionality. I've chosen enough as my One Word for 2013, and with equal parts trepidation and curiosity, I am anxious to see how it will grow me this coming year. Will you join me in choosing One Word for the year? It's not about doing more, but about being who you were created to be. Maybe a word popped right into your head. Maybe you need to let the idea percolate a bit longer. Either way, more often than not, your word finds you. You’ll probably have a love/hate relationship with it. That’s okay. If it doesn’t scare you at least a little bit, it’s probably not the right word. So… Together, let's stop should-ing on ourselves. What do you want to focus on in 2013? Who do you want to be by the end of the year? Once you've landed on your word, write a blog post about it. 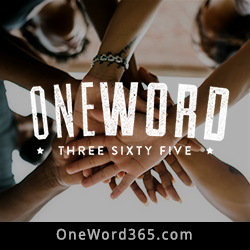 Then add it to the community link-up on the One Word 365 site.